Halloween is over, sniff sniff. I always wax a touch melancholy packing up the skulls and bats, simultaneously mourning the end of the Season of the Witch while savoring the tiny bit of caramel wedged between my molars from the final mini Milky Way bar. Yesterday I bid a fond frightful farewell to my favorite holiday, and made room for the next one: Thanksgiving. Because I go a little nutsy coo-coo for both Halloween and Christmas, I like to go a bit simpler in between the two for Thanksgiving. (Though admittedly my “going simple” is still over-the-top for most people. I’m like the Liberace of Holiday Decorating 😉 I’m also saving for holiday gifts, so spending cash on decor is a big fat no-no. It’s time to recycle! 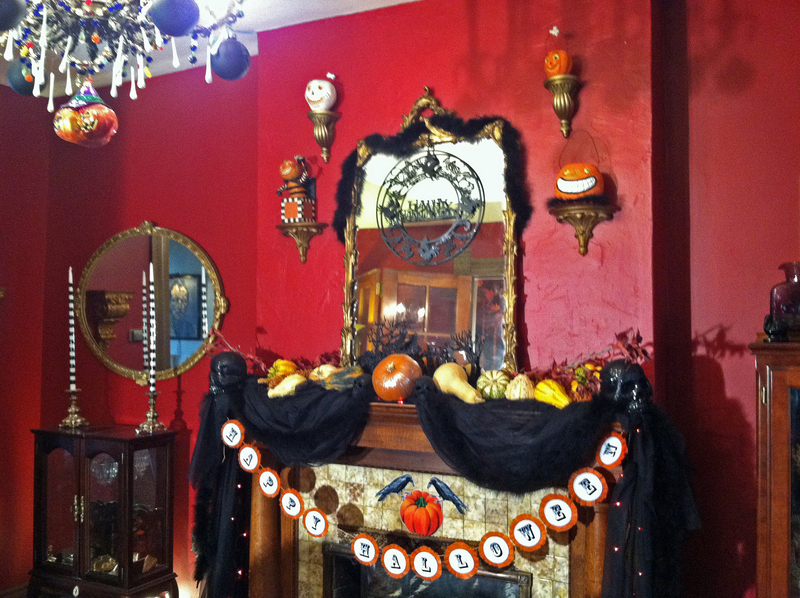 Thankfully Halloween and Thanksgiving have a lot of crossover decor: Pumpkins, gourds, fall leaves and the like, so it’s easy to do double-duty with the decorations. 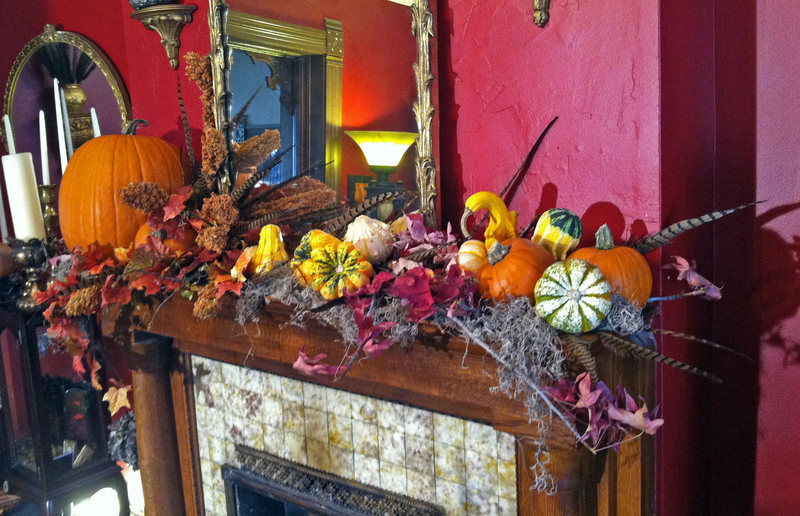 I simply saved the whole pumpkins and gourds, reused my silk fall leaves and did a little presto-chango on the mantle. I thought an asymmetrical arrangement might be fun this year, well that, and I had only one large pumpkin left that was still solid. 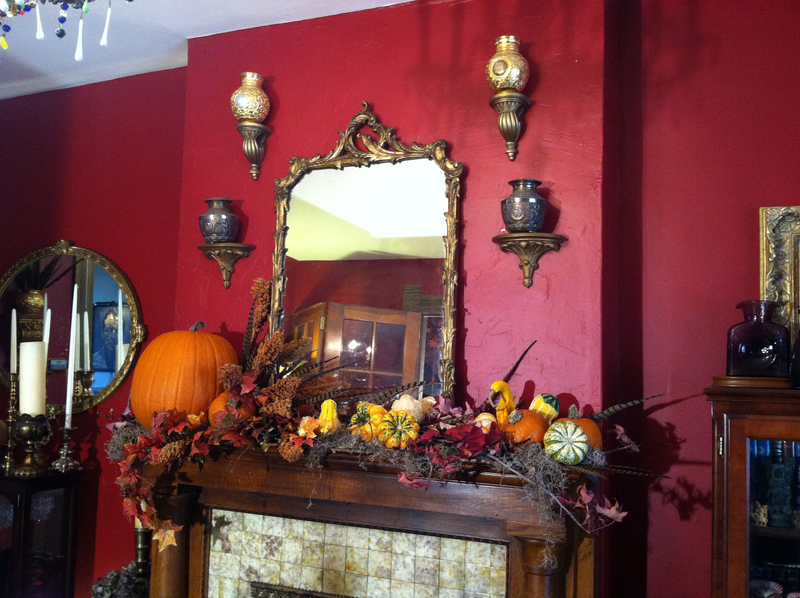 * I placed the big guy on the far left, then added one spray of my old faux fall leaves next to it on the right. Next I added some sticks and small branches with dried real fall leaves that I salvaged from my Halloween floral arrangements and from the yard. 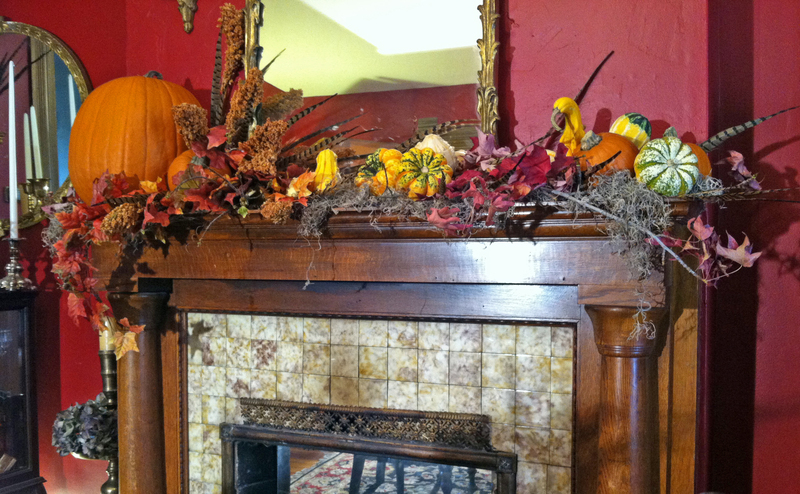 (That’s a great trick for using “faux” flowers and leaves: work in some real ones for a more authentic look). Then I worked in all the smaller leftover pumpkins and gourds. Nothing special here, I just set them in place on the mantle. As a final touch I tucked in some pheasant feathers (I reuse these for Thanksgiving and Xmas every year. You can find them cheap on Ebay), a few dried seed heads (I’ve been reusing these for about 3 years now) and some Spanish moss (I always have a bag of moss around for plants and flower arrangements. It gives the arrangement a grounded and finished look.). Done! I love that I didn’t spend a dime this year, and it still looks great. * FYI: I don’t know if this is just a fluke, but I bought three pumpkins the first week of October. One from Whole Foods and two from King Soopers. Both Sooper’s pumpkins had started rotting and had to be tossed. The Whole Foods pumpkin is still solid and looks great. Next time I’ll show you the rest of the Thanksgiving decor. FOLLOW this blog and you won’t miss a thing! 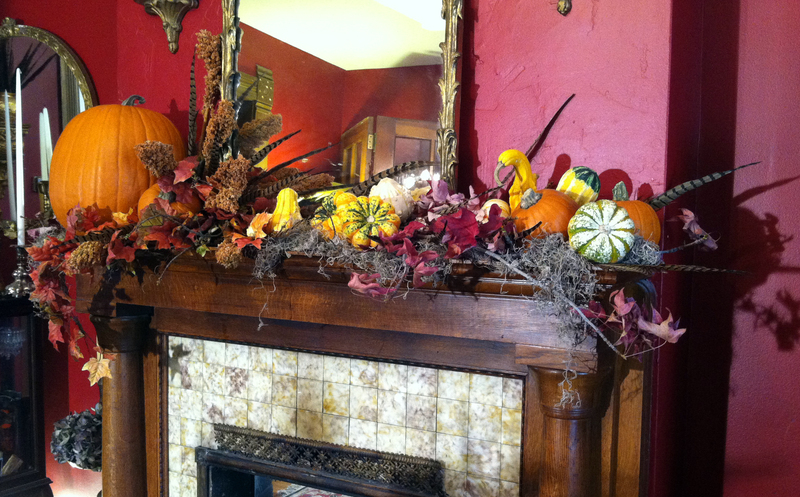 What decor items do you recycle during the holiday season? Tell me in the Leave a Reply/Comment section. 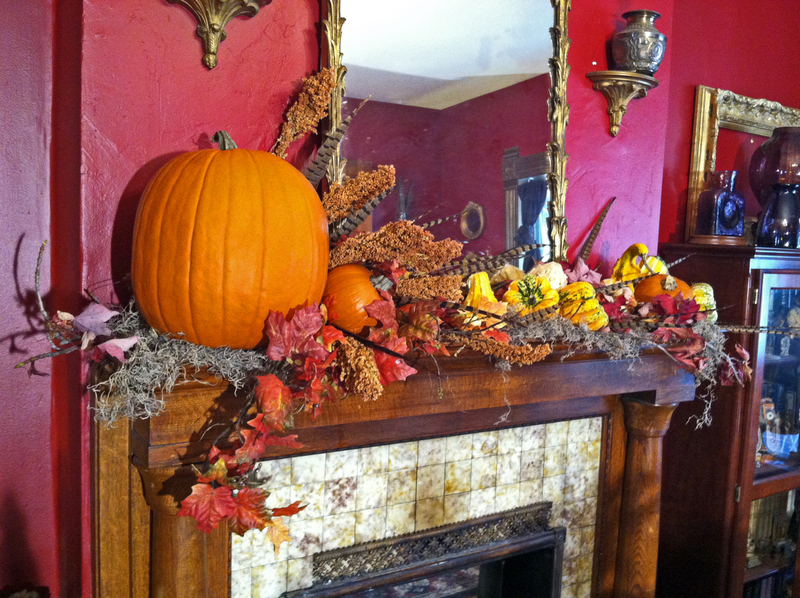 This entry was posted in decorating, DIY, Flowers, home, lifestyle, Thanksgiving and tagged best for less, budget, decor, decorating, DIY, fall leaves, pheasant feathers, redecorating, redo, restyle, saving, Thanksgiving, thanksgiving decor, thanksgiving decorating, thanksgiving gourds, thanksgiving mantle, thanksgiving pumpkins, thanksgiving recycling. Bookmark the permalink. 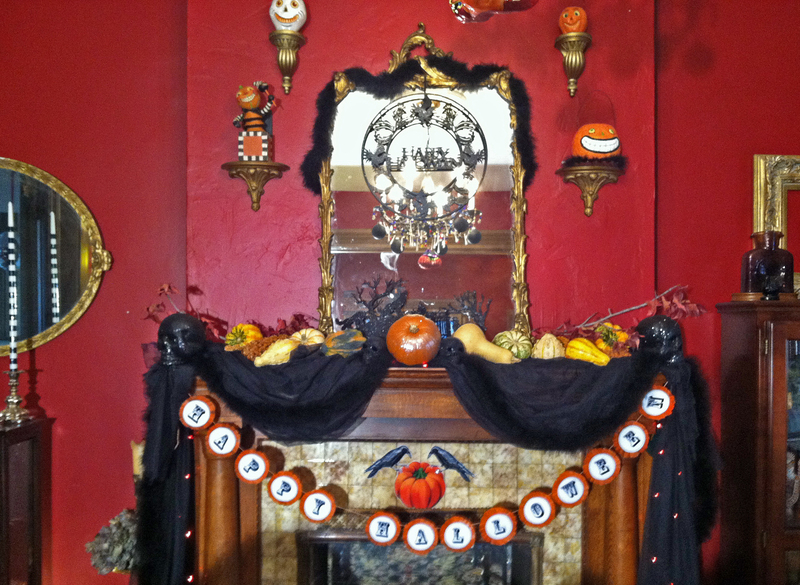 ← How I Did My Yard for Halloween This Year…And it’s All on the Cheap, of Course.